ASU startups win a total of $21,000 in cash prizes at Arizona Collegiate Venture Competition. ASU startup Force Impact Technologies earned top honors at the second annual Arizona Collegiate Venture Competition, winning a $10,000 cash prize and the Startup Territorial Cup. Arizona State University dominated the second annual Arizona Collegiate Venture Competition (ACVC) last month as four of its student startup companies placed in the competition, winning a total of $21,000 in cash prizes. The competition, a statewide event in which select student startups from ASU, Northern Arizona University and the University of Arizona pitch their companies, was held March 28 at the University of Arizona and was sponsored by Hool Coury Law and MAC6. Force Impact Technologies (FIT), a startup in ASU’s Great Little Companies (GLC) Network, won top honors, beating out 11 other startups from ASU, NAU and UA to win a $10,000 cash prize. FIT’s victory also secured the Startup Territorial Cup, a traveling trophy that goes to the winning team’s university each year, for ASU for the second year in a row. FIT was co-founded by Anthony Gonzales, an MBA student in ASU’s W. P. Carey School of Business, and W. P. Carey School alumnus Bob Merriman. The company makes FITGuard, a mouth guard for athletes that integrates force-detection technology. FITGuard measures the force of an impact and illuminates when the force exceeds a set threshold, giving athletes, coaches and trainers a visual signal that a player has been subjected to a level of force that could cause a concussion. All of the ASU startups that participated in ACVC placed in the competition. In addition to FIT, ASU startups Onvard, Duo Kitchenware and SafeSIPP received prizes. Onvard, an online platform that centralizes employee training materials for employers, won $7,000. Receiving $2,000 each were Duo Kitchenware, a housewares company that makes products specially designed for people with physical disabilities, and SafeSIPP, which has developed an innovative method to transport, purify and store drinking water in developing countries. Onvard and Duo Kitchenware are part of the Edson Student Entrepreneur Initiative, a startup accelerator that gives ASU’s student entrepreneurs the opportunity to develop their innovative ideas and launch viable startup companies. SafeSIPP, like FIT, receives support from ASU’s GLC Network. 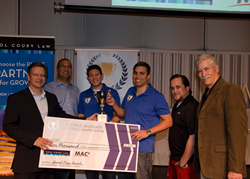 This is the second year in a row that an ASU startup has won the top prize at ACVC. Last year’s winner, Pollen-Tech, is commercializing an innovative alternative to bee pollination with the support of the Edson Student Entrepreneur Initiative. The Arizona Collegiate Venture Competition is a collaborative effort by the ASU Entrepreneurship and Innovation Group, the Northern Arizona Center for Entrepreneurship and Technology and the University of Arizona’s McGuire Center for Entrepreneurship. The event aims to showcase Arizona’s top student startups, foster collaboration among the state’s universities and highlight the outstanding entrepreneurship efforts at all three schools. Next year’s event will be hosted by Northern Arizona University. The Edson Student Entrepreneur Initiative gives Arizona State University’s student entrepreneurs the opportunity to develop their innovative ideas and launch viable startup companies. The initiative provides funding, office space, training and mentorship over a 10-month period to help students launch and grow their for-profit, more-than-profit or nonprofit ventures. The Great Little Companies Network supports up to 30 student startups each year that apply for but are not accepted into the Edson Student Entrepreneur Initiative, ASU’s student startup accelerator. Each startup invited to participate in the GLC Network receives $3,000 in grant funding as well as direct mentoring through the Changemaker Central locations on each of ASU’s four campuses.